Some of you already know that I joined a local art co-op a few months ago. We’ve been quite busy trying to get the studio up and running as a co-op and last night we had a reception for friends and family. The turn out was great, and the gallery looked extremely nice. The website is being updated, but you can go to Art and Soul Studios to learn a little bit about us. I also learned that I sold one of my pieces! What more encouragement can you ask for than to have your art sold! 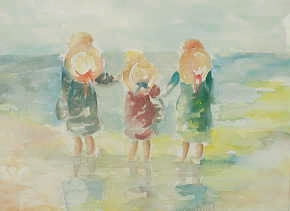 The piece is called “Three Sisters”, painted with watercolor. I have to work on replacing this piece and haven’t decided on whether to do another watercolor or continue to work on some more charcoal or colored pencil. The painting that sold definitely inspired me to work on another one with the same theme. There is one that I’ve thought about doing with my son and nephews…We’ll see!